University of Cincinnati (UC) researchers will develop a dry-cooling system, featuring an enhanced air-cooled condenser and a novel daytime peak-load shifting system (PLSS) that will enable dry cooling for power plants even during hot days. 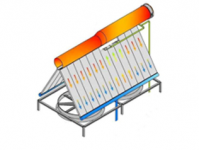 The team will transform a conventional air-cooled condenser by incorporating flow-modulating surfaces and modifying the tubular geometry of the system, both of which will reduce heat transfer resistance and increase the thermal surface area. Whenever the air temperature becomes too high for the air-cooled heat exchanger to be effective, the PLSS will cool the air inlet temperature back down to acceptable temperatures. This inlet air-cooler technology removes heat from the incoming air and stores it in a thermal energy storage (TES) system that incorporates phase-change materials, which can store and release heat over a range of temperatures. During periods when the ambient air is cooler, the TES will release the stored heat to the atmosphere. Together, the combined innovations could quadruple the condenser's coefficient of performance, while the system's compact design will result in a smaller footprint than other air-cooled designs. If successful, UC will develop an enhanced air-cooled condenser and cool storage system that enables more efficient dry cooling even in hot temperatures. Power plants can maintain energy efficiency by using the team's air-cooling technology instead of water cooling when water use is restricted. UC's design results in no net water consumption for cooling, and therefore eliminates the need to draw on local water resources. UC's heat exchanger and pre-inlet air-cooler are designed to be very compact and occupy a smaller footprint, which help lower the technology's cost to the point where it would be commercially attractive.